This Workwear unisex top features a V-neck, dolman short sleeve and chest pocket with a pencil slot. Center back length is 27 1/2". Made of soil release poly/cotton. 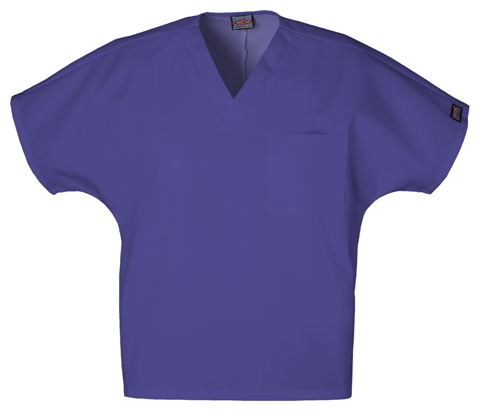 These scrub tops keep their color and soft feel for many washings. Good quality and good value. This is nice and flexable. At first i thought it was going to be hard and not flexable and i would be walking around like Tinman but I was wrong it light weight so I forgot I even had it on me. This coming from a Guy. I say you should buy it. Fair Price, Good Quality, arrives on time. It is a good product, in my experience the wine color, (not this one) tends to release some ink during the first wash...besides that, this is a great produtc. I own 7 sets.